I have written one article to create linked server with Access database but I seen in many forums that people mostly would like to use excel file and wants to import its data. However, there are many ways to import Excel data to SQL Server but Linked server gives you more freedom over data. Let us see how we can do this. Before you start doing this, I would like you to create one excel 2007 file named “Dept” and put it in C: drive. 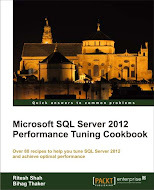 Now let us move to SQL server and make linked server.